I want to ramble about the whole Gervais "mong" issue that's been flitting about Twitter today, just to get it off my chest as much as anything. I suspect I'm not going to change anyone's mind - if you think using the term "mong" as synonymous with "idiot" is perfectly acceptable, then fine. I disagree, quite strongly, but similarly my mind is unlikely to be changed on this issue. I was called "Mong", and "spaz" when I was at school - and I used those terms, too. Then I was reminded by a friend that these terms came from the terms mongoloid - the old term for Down's Syndrome, and Spastic. Once I'd been reminded that these terms had their roots in terms for Disabled people, and they weren't that far removed from those roots, I couldn't, in all good conscience, use them. I had to use other words instead, which there are plenty of. Language does change over time. "Blimey" is now just an expression of surprise, it doesn't get used to mean literally "blind me". But if a significant proportion of people to whom a term refers states that that term is offensive to them, then I don't think that term has detached itself from its old meaning, and to continue to use it means taking responsibility for knowing it will be interpreted in it s multiple senses. 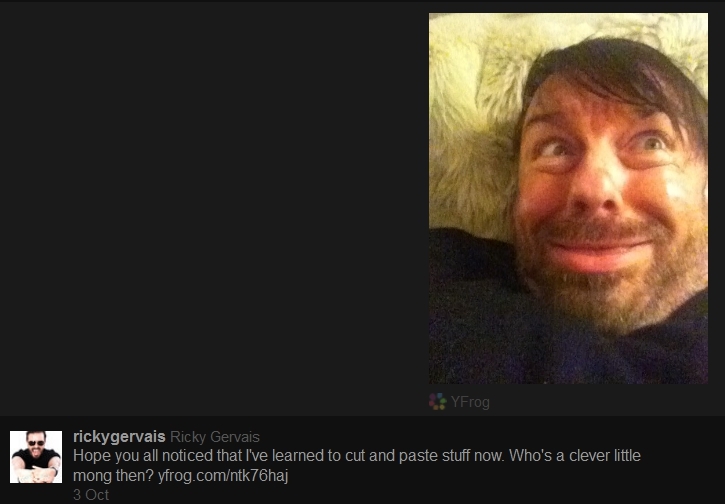 I also question Gervais' intention with the term "mong". Considering he has posted photographs of himself pulling faces which could be seen as mimicking some with learning disabilities, labelled with things like "Who's a clever little mong then?" I think he knows very well what he's doing, and he's perpetuating the old line that learning disabilities = stupid = funny. What I'd like to know is, would he make comments (jokes?) about being a "mong" to someone with Down's Syndrome? If not, then I don't think his conscience is clear, and he knows full well the impact of language like his. I think even if some people still use mong to describe disable people, he said from the start, WAY before he joined twitter on his Science stand up (2010) that he didn't mean it to mean disabled. Plus, the faces aren't mocking disabled people; he's been posting a variety of weird face pics on his blogs for a while now. BIG misunderstanding as, of course, if he was mocking disabled people it's out of order. But, he isn't. He knows that, 50% of us know it and the rest I don't think he really cares about. People just like laying into celebrities - the fact that he has a reputation for having an "ego" doesn't help much.